The Journal of Gender, Agriculture and Food Security, in collaboration with the CGIAR Research Program on Policies, Institutions, and Markets, invites submissions for a special issue on policies, institutions, and markets. 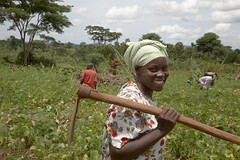 Papers should focus on the broad issues of how gender interacts with policies, institutions, and/or markets in the areas of agriculture and food security. We will consider papers that are theoretical or conceptual, but are particularly interested in empirical papers using qualitative or quantitative data. One-two page abstracts should include information on a statement of the problem, the research question, the methodology, the data used, and preliminary findings. In addition, those submitting abstracts are invited to participate in a one-day write-shop on July 14, 2015 in Berlin to obtain feedback on the paper. Each selected participant will have the opportunity to present the paper and receive suggestions from experts in the field. It is expected this feedback will be more in-depth and constructive than usually received at academic conferences. The write-shop is scheduled to precede the annual meetings of the International Association for Feminist Economics (IAFFE), which take place from July 16-18. Participants in the write-shop are encouraged to attend the IAFFE meetings and present their paper in that forum as well. Please note that the deadline to submit a paper for the IAFFE meetings is also April 4, but you have to apply separately. Please submit your abstract to editors@agrigender.net by April 4, 2015. When you submit your abstract, please indicate whether you are also applying to attend the write-shop, and, if so, whether you would like to be considered for funding to participate in the write-shop. Limited funding is available to support the additional costs of attending the write-shop (two nights of hotel and modest per diem). Abstracts will be reviewed and decisions made by May 4, 2015. Selected participants are expected to send full draft papers by July 1, 2015.